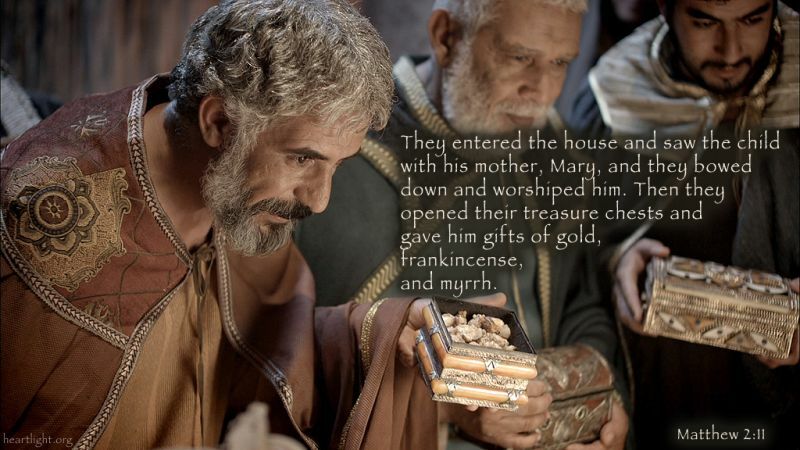 Have you wondered how long Mary remembered the aroma of myrrh? My jammie pants ended up in the dryer... again! At 5'10", I have a hard enough time getting them to reach my ankles without having them shrink. Not wanting yet another Capri-looking set of pajama bottoms, I Googled ways to un-shrink clothes. One source suggested soaking them in water with a capful of baby shampoo. It can't hurt, I thought as I put the item on my shopping list. A few days later, I started the Make-My-Pants-Long-Again project. I filled the kitchen sink with lukewarm water and added the shampoo. Nostalgia swept over me as its unmistakable aroma reached my nose. How many times had I bathed my Bubba in that sink when he was little? I recalled his first baths in that large, white basin, fearful that I'd drop his small, wriggly body onto its hard sides. I "saw" him as he grew over the months, laughing hysterically as he soaked everyone and everything as the aroma of baby shampoo filled the air. "Mom, what are you doing?" my daughter asked, snapping me out of my flashback. Dropping the pants I was cradling, I sheepishly replied, "I, uh, um, I'm making my pants long again." Scents have the power to move us in time, merging the present with the past. But could it also predict the future? We all know of the gifts the wise men presented to Jesus, but what shocked me was to hear a description of myrrh. 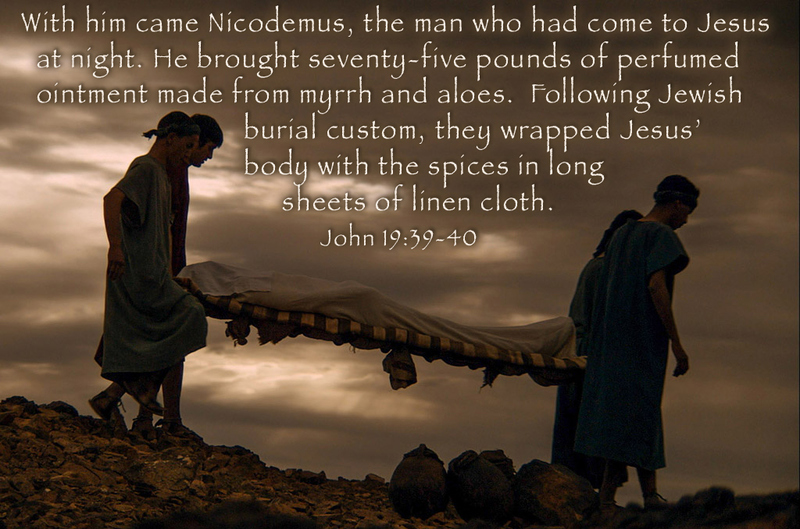 Myrrh's main use back in Jesus' day was to treat wounds and pain as well as being used in rites associated with death and burial (John 19:38-40). Gold and frankincense were fitting gifts for the infant king. But why myrrh reeking of its scent of death? Did its odor override the sweet aroma of the newborn, drawing them back to when one of their loved ones was buried? Just like shrinking your pants can't be reversed, baby shampoo or not, the myrrh hinted at something that was already set in motion that couldn't be undone. Death was on its way. While Christmas is a time of celebration, let's stop long enough to soak in the aroma of the myrrh, for the bitterness makes the rejoicing that much sweeter. Because God's children are human beings — made of flesh and blood —the Son also became flesh and blood. For only as a human being could he die, and only by dying could he break the power of the devil, who had the power of death. Only in this way could he set free all who have lived their lives as slaves to the fear of dying (Hebrews 2:14-15 NLT). What smells are nostalgic for you? Why? How would you respond if someone gave a perfectly healthy newborn an obituary notice? 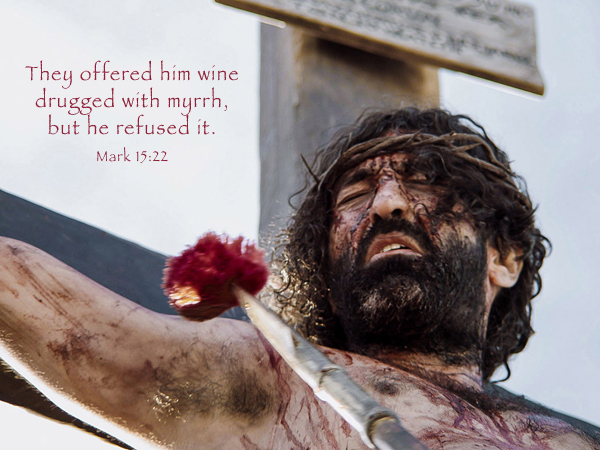 What was offered to Jesus during the crucifixion that He refused (Mark 15:23)? According to John 19:25, who was near the cross during Jesus' crucifixion? Do you think she remembered the gift of myrrh given at Jesus' birth or smelled it as it was offered to Jesus as He hung on the cross? Leave cookies in the oven too long or overcook a bag of microwave popcorn. Soak in the pungent aroma as a reminder of the not-so-savory gift given to Jesus. This excerpt is taken from Stacy's book, Savoring Christmas: 31 Days to Prepare Your Heart for the Messiah. "The Scent of Myrrh" by Stacy Voss is licensed under a Creative Commons License. Heartlight encourages you to share this material with others in church bulletins, personal emails, and other non-commercial uses. Please see our Usage Guidelines for more information.